The third leg of the British Athletics Cross Challenge took place today at the Antrim IAAF International Cross Country event. A sprinkling of morning rain made for muddy underfoot conditions for the later races while temperatures remained cold throughout the day. Andy Vernon (Coach: Nic Bideau) and Charlotte Purdue (Mick Woods) were the first Brits across the line in the two senior races, which were won by World Cross Country champion Japhet Korir and Mimi Belete of Bahrain. The last event of the day lived up to expectations as World Cross Country champion Japhet Korir of Kenya won a three way battle for the title as he outsprinted defending champion Thomas Ayeko of Uganda and fellow Kenyan Emmanuel Bett to win in 28:40 for the 10,000m course. Andy Vernon was the first Brit to cross the line, having led on the first lap he slipped to sixth on the second lap and maintained his position until the final lap, where he began to close on fifth place but ran out of time in the home straight and crossed the line with a time of 29:34. 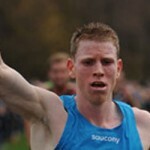 Vernon was pleased to continue his 2013 form that saw him win individual bronze at the European Cross Country Championships in Belgrade last month. He said: “It started off pretty quickly and then it settled down but it was still quite a fast pace for the first part of the race going through the mud at the bottom of the course. A hill slowed the race down and I thought there was no point in slowing the race down so cracked on and led through the end of the first lap. Adam Hickey (Eamonn Martin) was second in the British Athletics Cross Challenge, finishing tenth overall, while Dewi Griffiths (Kevin Evans) was third thanks to a 12th place finish overall. An exciting senior women’s race was eventually won by Bahrain’s Mimi Belete in a time of 18:07 as she broke away from two-time world 1500m champion Maryam Jamal and Almanesh Belete in the last of the three laps. Early on there had been a leading pack of seven, which included the British duo of Gemma Steel (John Nuttall) and Charlotte Purdue. Steel, who won individual silver in the senior women’s race in Belgrade, led Purdue and two-time European champion Fionnuala Britton of Ireland after 4,000m but Purdue rallied to close the deficit and win the Cross Challenge with a fifth place finish overall, 15 seconds ahead of Steel. 22 year old Purdue was pleased to have followed her European under 23 bronze medal from last month with another strong showing today. She reflected: “It was a really fast race; it was only 5.6km and for me that’s quite short. I just sat in and then on the last lap just went with the group. I got a bit detached and it was really hard to get past people but I gave it my best shot so I’m happy. 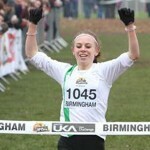 Third in the British Athletics Cross Challenge was Rosie Smith who crossed the line with a time of 18:59, in 17th place overall. Ireland’s Aaron Hanlon stretched away on the final lap of the combined under 20 and under 17 men’s race to win by a considerable margin. After the first of three laps there were a dozen athletes in contention but by halfway Hanlon had broken clear along with under 17 Euan Gillham (Robert Hawkins) of Kilbarchan. As Hanlon pulled away, Gillham maintained his form to cross the line in 17:23 and finish as first Brit in Antrim for a remarkable fourth time. The 16 year old was delighted with his performance, he said: “I got a bad start because I was third on the start line and it took me a whole lap to catch up with the leading group. After that I settled a little bit but I didn’t stay for long so I pushed on because I was running at a faster tempo than them. The first Cross Challenge eligible under 20 athlete was Aiden Thompson of Pitreavie in third overall, followed by Jonathan Glen in fifth. The combined under 20 and under 17 race was dominated by runners from the younger age group as Ireland’s Siobhra O’Flaherty won overall and the British Athletics Cross Challenge event was won by 15 year old Gillian Black, representing Scotland. O’Flaherty set a relentless pace from the gun and had a 20m gap over Black at the halfway point, who in turn had a similar lead over the chasing pack. O’Flaherty extended her lead to win by over 30 seconds in a time of 12:47 while Black crossed the line 13:20. “It was good,” Black said afterwards. “I got a much better start than I did in Liverpool which helped me and I really enjoyed the course. 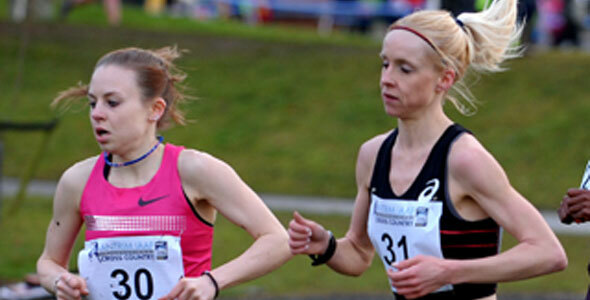 Catriona Graves, who finished third overall, was the first under 20 with a time of 13:23. 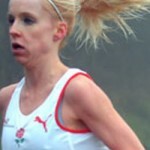 Just behind her was Wales’ Kate Seary, second in the under 20 age group, and Kathryn Gillespie in third.